Among well-read investors who study the sources of wealth in America today, Dr. Thomas Stanley’s 1996 book “The Millionaire Next Door” was the seminal work dedicated to studying the behaviors of the affluent which were at odds with public perception. Notably, Dr. Stanley pointed out that $2,000+ purses and $10,000 per year country-club memberships, or whatever other type of veblen good activities your imagination associates with conspicuous consumption, only accurately describes roughly a third of millionaires, with the slight majority of millionaires making purchases that we tend to associate with the upper tier of middle-class consumption (e.g. see Stanley’s classic reference to “the Toyota millionaire households”). And yet, as Market Watch recently reported 69% of Americans think that the very wealth get their wealth from inheritance. That belief is totally bunk. In 2018, the wealthy have received their wealth at the lowest rate in the history of this country–with only 4% of households that generate income of $100,000 or more in investable income deriving that source from an inheritance. The 2018 data supports the same conclusion that the 1996 data showed–extreme wealth is all about business ownership. This Chart illustrates the sources of wealth for the super wealth that earn $100,000 or more per month, with the supermajority of such wealth coming from business ownership. Once again, the mega-riches accrue to those who own their own businesses, with 60% of the households that earn $100,000 or more each month having an ownership stake in a business that they control. This is logical, as this is the class that receives the direct benefit of any increase in sales growth. If a beer distributor sells an additional 1,000 cases of beer with a $5 profit than last year, that act alone is an additional $5,000 in monthly income that flows to the owner of the beer distributorship. The truck driver earning $18 per hour does not receive any meaningful direct benefit from this, except to the extent that it may take an additional hour or two to drop off those additional cases. Whatever the industry may be, the default terms follow this pattern–any rate of growth that exceeds the rate of growth in expenses means that the surplus will flow to the owner. Also, interestingly, is that “insiders” with significant stock compensation is on the list. Although there is no official reason given, I suspect that the reason why a tenth of fortunes that churn out $1.2 million per year in income come from insiders is due to (1) the rise of tech millionaires who are awarded stock ownership positions that have compounded at absurd rates over the past decade, and (2) the artificially low standard for earning performance bonuses in corporate America, with the median S&P 500 executive bonus tied to 7% annual gains in the combined price of the stock and dividends, making it easier for executive teams to earn huge blocks of stock without having to clear a difficult performance hurdle (e.g. 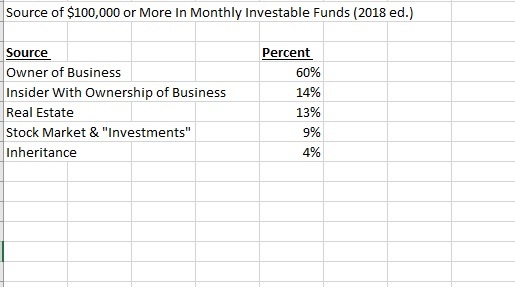 417 of the 503 S&P 500 firms, based on how the S&P 500 was constructed in 2008, achieved at least 7% annual returns from 2008 through the start of 2018). It is also notable that real estate has a place, albeit a subordinate one, on the list of wealth. The average residential rent in the United States is $1,120. For the super wealthy who own the equivalent of 89 residential properties, or a dozen well-chosen commercial buildings, the cash flows from tenants are enormous. But it is also logical that real estate investors maintain such a subordinate level of wealth compared to that of business owners in that there is an inherent limit to raising rents. At best, A landlord might be able to raise a rent 8% per year in a particularly hot location. Someone who sells widgets can go from selling 1,000 widgets to 2,000 widgets in a year. In a dream, best-case scenario, a landlord might be able to double rents once every decade (with the median real estate doubling of rents occurring every 23.2 years). And lastly, it is logical that at the wealthy end, one cannot “save” their way to millions. Ronald Read, the janitor who set aside every penny he made throughout a lifetime and died with a fortune estimated at $8,000,000, maxed out at $20,000 per month in dividend and interest income. Also, publicly traded stocks tend to only pay dividends of 3% or so. That would require a $40 million fortune to bring in $100,000 per month! Inheritance plays only a rounding error role in the story of American wealth today. It is all about business ownership, either directly by founding and controlling a business, or by being such a high-ranking executive that you receive blocks of stocks as part of your labor compensation. From there, there are dribs and drabs of the super wealthy who get through real estate or investing by virtue of a professional career with a high savings rate. The verdict is in. If you want to become among the wealthiest in America today, you have to start and grow your own business.